Buble's latest album features your favorite Sinatra, Bee Gees and Elvis songs, typical Michael Buble' sounds in an American Songbook style, with one teeny little surprise. . .
. . . a duet with Reese Witherspoon. I didn't know what to expect from that, but I loved it. I'm a Reese Witherspoon movie fan, but I didn't realize she could sing. Sweet. 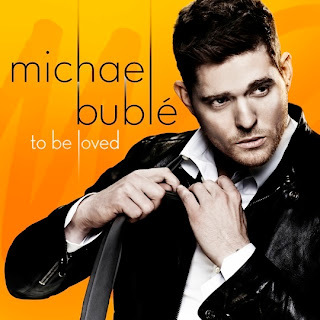 To Be Loved also features four original songs co-written by Buble' that give us a glimpse of his personal life, the life of a man very much in love. Also? Buble' is about to become a first time dad. "I want to take you on a wonderful journey about love -- all different kinds of love," Michael says. "The album swings big time: it rocks, it's soulful, it's happy, sometimes a little sad. It's romantic, it's yummy, and it's heartfelt. Do not think I take my success these last ten years for granted. I was anything but an overnight sensation, which inspires me to deliver big time for my fans -- maybe even make some new ones this time out," says Buble'. "I labored over every song, every note and every arrangement because I can't resist trying to make each record better than my last one." "I wrote Close Your Eyes about my wife and about the power of all the women in my life -- my sisters, my mom, my grandma and all women in general. Let's face it, where would we be without them? I Got It Easy, another original, is basically a song where I count my blessings and is a reminder to me and everyone to appreciate all the good parts of life. I'm a very lucky guy and I never want to forget it." You Make Me Feel So Young on YouTube. Buy To Be Loved on Amazon. Disclosure: I participated in this campaign for One2One Network. I received a free copy of the album to facilitate my review. By posting, I am eligible for incentives. All opinions stated are my own.